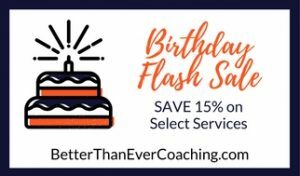 This hands-on program is designed for Independent Professionals and Entrepreneurs, who want to learn how to create an endless stream of clients by doing 10 simple things per day! Experience the coaching, accountability and support provided by the road-tested GET CLIENTS NOW!™ 28-day marketing program. 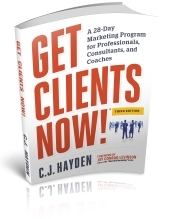 In this highly effective action format, you work together with a trained coach to get more clients. Closed Facebook Group only for the participants of this program to ask questions, share successes, etc. “The Get Clients Now!™ program facilitated by Helen Kosinski was an incredible learning experience at so many levels! I am leaving the program with a pocket full of practical, actionable tools and strategies to successfully market my professional service business. The program itself is simple, no-nonsense, easy to follow, and can be used again and again to develop the steady and successful management of your marketing! “It (this program) has introduced me to many new ideas and has been a bit of an eye opener for me. …I have already started changing some of my behaviors around meeting people and marketing myself. “I gained a very clear insight into the way I operate and that there are basic simple steps to change a few of my stubborn bad habits – as long as I stick to them. Also, knowing that other people deal with issues parallel to mine, even though they’re not in the same business was very reassuring. Thank you for your interest in The Get Clients Now!™ program! Registration for the October 2017 event has closed. The schedule for 2018 will be posted in the near future. Please bookmark this page and check it regularly for the updates or register for the “What Could Be Better?” newsletter (at the top of the next column) and you’ll be one of the first to know when the new schedule is available. It will be WONDERFUL to have you join us next time! The Get Clients Now! book will be used as the text for this program. If you do not already own a copy, you can purchase it by clicking this Amazon Link (this is an affiliate link for Helen, she receives compensation when you use this link) or you can purchase this book at your favorite book store. For our group program, the teleconference line used for our meetings may be a long-distance call for you. You will be responsible for any toll charges you incur to call this line. A complete refund is available up to 14 days before the start of the program. However, after that time, if you need to cancel, you will be given a credit towards a future Get Clients Now!™ program. Once your payment is received, you will be sent an e-mail confirmation with additional information about this program!